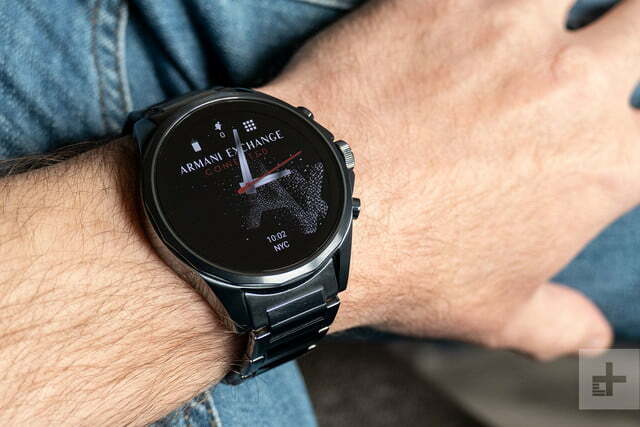 The Armani Exchange AX Connected is a subtly designed fashion smartwatch that’s too understated for its own good. The Armani brand has grasped the smartwatch reigns and not let go, launching smart wearables with and without touchscreens. The latest comes from Armani Exchange, the more affordable part of the brand. Don’t expect that to mean the Armani Exchange AX Connected is cheap. It costs $295, about the same as every other designer Wear OS smartwatch you can buy at the moment. Except if I hadn’t told you this was an Armani smartwatch, would you have known? 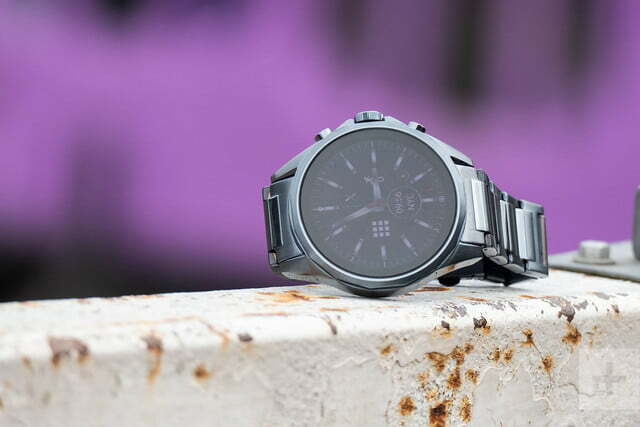 Armani Exchange’s fashion is moderately understated, but this watch takes it to a new level. You’ll buy it for the look, certainly, but there’s nothing that really marks it as an Armani watch, and this means it struggles to stand out. It’s a surprise, and may have the odd effect of putting people off, because it blends in to the crowd. I was getting ready to come down quite hard on the Armani Exchange AX’s design. It’s good looking, but it’s really simple — going about its life without flourish or great visual excitement. This bothered me, but I wasn’t sure if it was because I wanted more, or if the AX was too boring. It was standing in a queue of people in a cafe, right after I checked a notification, that things came into focus. Right in front of me, someone was wearing a Fitbit Blaze, which is easily one of the most unattractive things you can put on your wrist. The AX looks like a Van Gogh painting next to it — an artistic triumph. I was glad I saw the notification on it, and not a Blaze. It reminded me how easy to forget not all smartwatches have a good design. 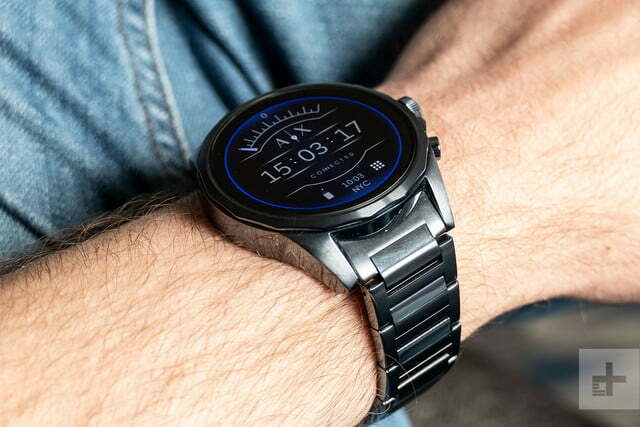 The AX’s subtlety is great — it looks like a watch, and it has a well-fitting metal band, plus it comes in a beautiful muted, metallic blue color. It doesn’t scream Armani, or even high fashion, at you. This restrained design is to be applauded, but here it comes dangerously close to being faceless. Just another smartwatch, and not one our heart tells us to buy. You only know it’s an AX watch from the tiny logo located on the crown, and on one of the strap links. The AX has a 1.2-inch screen inside a surprisingly slim 12mm thick case. However, the case is still large at 48mm, so it’s not one for those with very small wrists. That said, the design is clever and minimizes how large the watch should look — see the guard pieces around the crown, the simple bezel design, and lack of visible screw heads or other eye-catching features. The horns are expertly blended in with the case and strap, and apart from the side buttons feeling too wobbly and a little cheap, the build quality overall is superb. If I hadn’t told you this was an Armani smartwatch, would you have known? The Armani Exchange smartwatch is made from stainless steel and available in silver, gold, black, or blue. Each comes with a metal link bracelet in the same color, which is lightweight, comfortable, and only occasionally caught wrist hairs. It did require resizing before being worn, which can be done at home with a few simple tools, or by a jeweller. The blue is unusual, looks really excellent, and is the one I’d choose. You can’t escape the relatively ordinary look though, and annoyingly the included watch faces don’t inject much excitement into the watch either. There’s a chronograph look, a modern look, an Armani logo look, an ugly look, and a boring look too. I struggled to pick one I liked enough to show everyday. The watch face is crucial, and it should make our hearts flutter when we look at it. Some faces do have little animations that play when you wake the watch, but it’s not quite enough to make me love them, and probably takes more life from the battery anyway. If the design is somewhat ordinary, then the technology inside will give you deja-vu. The aging Snapdragon Wear 2100 processor is inside with 4GB of internal storage space, while the 1.2-inch OLED screen has a 390 x 390 pixel resolution. It has GPS, a heart rate sensor, NFC for Google Pay, and the latest version of Wear OS. That’s identical to all other Fossil-produced fashion smartwatches available now, and it’s difficult to recommend one over the better equipped Fossil Sport. The vibration alert is like the design, very subtle, and the screen even at maximum brightness is difficult to see in bright daylight conditions. 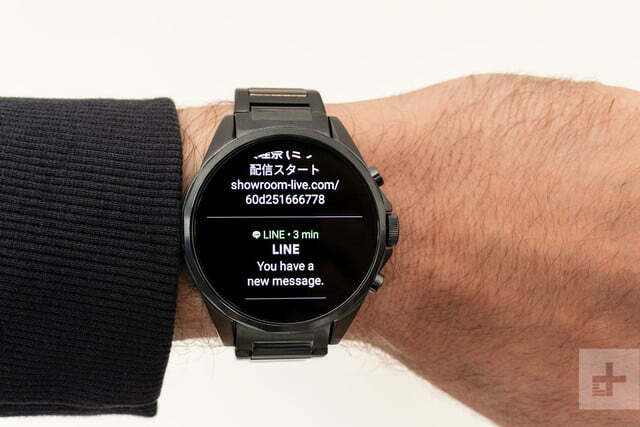 Wear OS connects to both iOS and Android phones with the corresponding app. I used the watch connected to a Huawei Mate 20 Pro and a P30 Pro. Connect to an iPhone, and there are fewer features available. I recommend not buying one if you use an iPhone, as the Apple Watch provides a vastly superior experience. Is Wear OS really that bad? Yes and no. It’s a lot better than it used to be, but that doesn’t make it good. There was a level of expectation when the last update was released, adding a new design and improved navigation, but that only brought it closer to Samsung’s Tizen and Apple’s WatchOS’s ability, and since then Google has not built upon its opportunity to catch up. It remains third best, in a three horse race. If the design is somewhat ordinary, then the technology inside will give you deja-vu. What’s the problem? Speed for one. Things take time on a Wear OS watch, due to swipes, button presses, and delays caused by the wheezy processor. That’s once you’re used to the OS too, as finding settings and features takes a while to learn. The AX has a rotating crown to zip through vertical menus, which does help speed things up. Notifications arrive in a long list, accessed by swiping up from the bottom of the screen, and are interactive. Tweets can be Liked or replied to, as can emails and messages, for example. 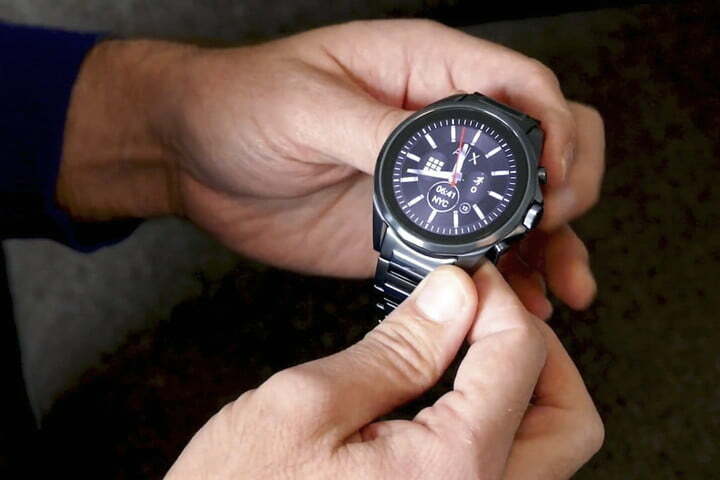 Armani does not install any superfluous apps, adding only a Saved Looks app to store modified watch faces. 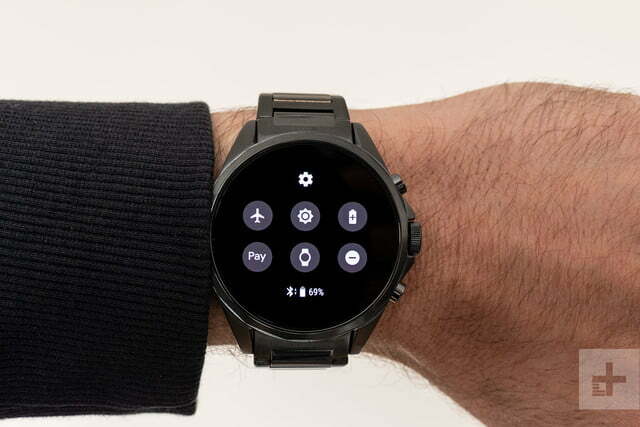 While we don’t want pointless extra apps, something to distinguish the AX Connected from the other fashion smartwatches out there would be nice. It all feels a little half-hearted, like Armani Exchange couldn’t be bothered to personalize the watch. What’s good? Music control for what’s playing on your phone is helpful, and the notifications work well, despite being slightly unreliable. Multiple alerts for the same notification are common. Google Fit is great, and it’s easy to track workouts with the pre-made settings, and it all transfers seamlessly to Fit on your phone. However, like the rest of Wear OS, it’s slow getting to the right menus. Battery life is the other problem. 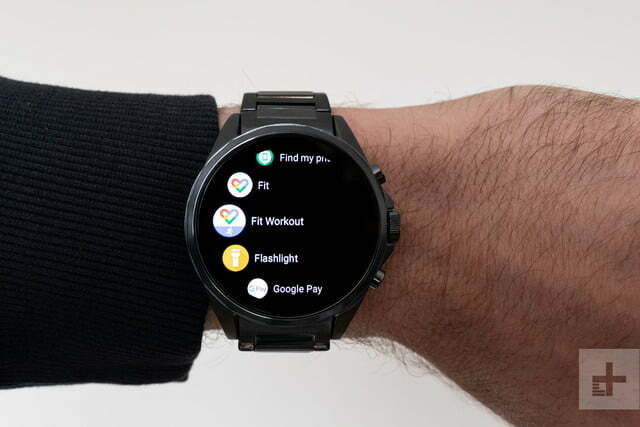 Wear OS switches the always-on screen off by default, along with background heart rate tracking, to help mitigate the issue, but this does limit the watch’s usefulness. With these options on, and a quick 40 minute GPS-enabled walk during the day, the battery struggled to last 12 hours. With them off, it’d last until the late evening. This isn’t a fitness watch, despite some of the features, and won’t be anyone’s first choice to wear at the gym, but leaving the heart rate sensor running is a good way to judge overall fitness, even if you’re going about your daily business. Charging is fast using the proprietary plastic plinth included with the watch. It magnetically clips to the case back, and zips to full in just over an hour. The Armani Exchange AX Connected costs $295 regardless of color choice, and is available directly from Armani’s website, Amazon, and other retailer partners. 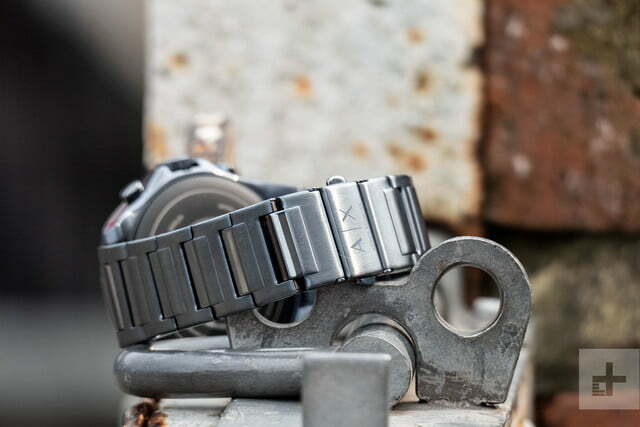 The company’s warranty covers the watch for a single year, but it does not include wear and tear. 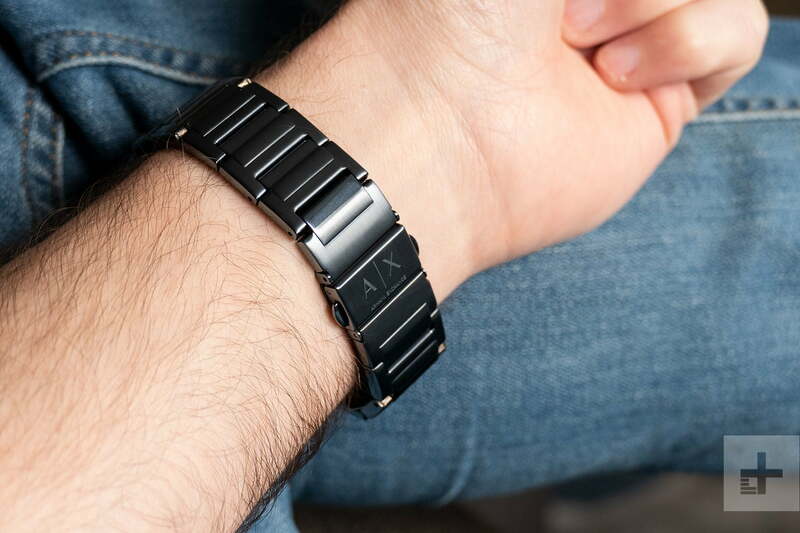 Buying the Armani Exchange AX Connected is like choosing one black sweater over another black sweater, just because it has a tiny Armani Exchange logo on it. It doesn’t stand out, or provide any specific reason to purchase it over another, aside from that brand name. You do get a high quality product that performs its functions correctly, just don’t expect it to have a personality. If you own an iPhone, the Apple Watch Series 4 (or even the Series 3, if you’re on a tight budget) is a much better choice. 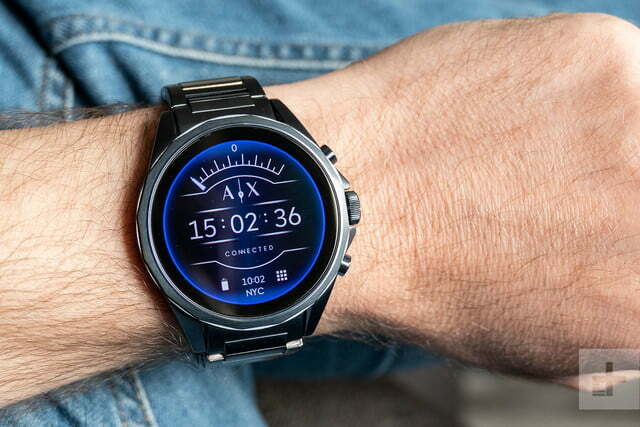 If you own an Android phone, the AX Connected is a decent smartwatch option, but the main selling point is the relatively subtle design. You could buy any of the most recent Fossil-produced Wear OS smartwatches and get the same user experience, and let your buying decision be entirely guided by looks. For example, check out the Diesel On Full Guard 2.5, the Emporio Armani Connected, or even the Kate Spade Scallop 2, all of which start at the same $295 price. 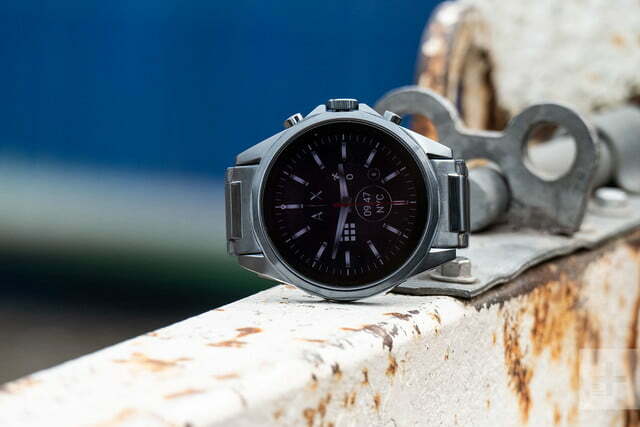 The list continues with our favorite Wear OS watch: The $255 Fossil Sport. It has the new Snapdragon 3100 processor, but only a fraction of the AX Connected’s style. 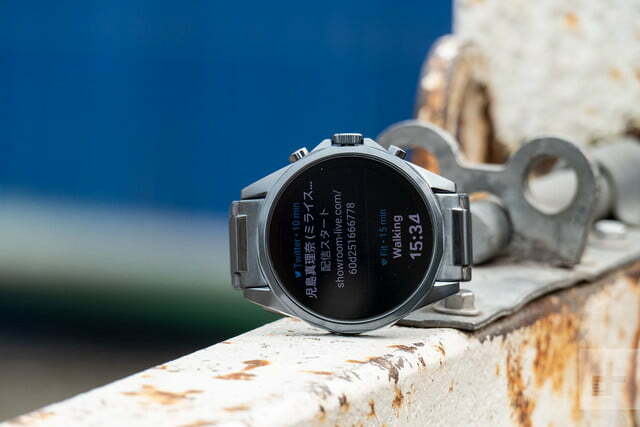 The $160 Mobvoi Ticwatch E2 is half the price of the AX Connected, has the same features, but absolutely none of the style. You’re spoiled for choice when it comes to smartwatches; but before you buy one, make sure you’re certain it’ll be useful to you in everyday life. 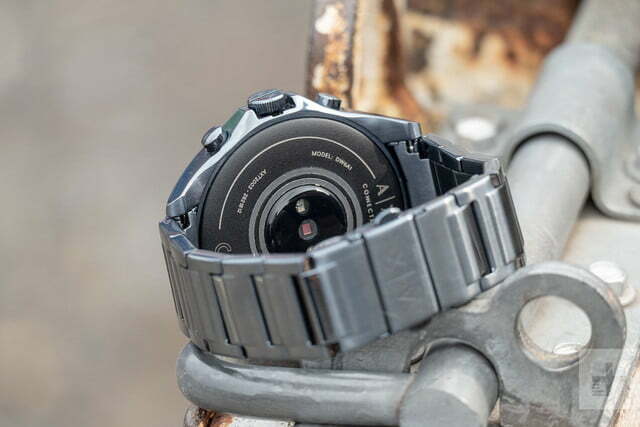 The watch is water resistant, so it isn’t afraid of getting wet, but it’s not especially tough so you won’t want to wear it when climbing any rock faces. The battery’s lifespan will limit the amount of time it remains functional, but realistically it shouldn’t have a noticeable impact on usability for at least two years. No. There’s nothing wrong with the AX Connected. 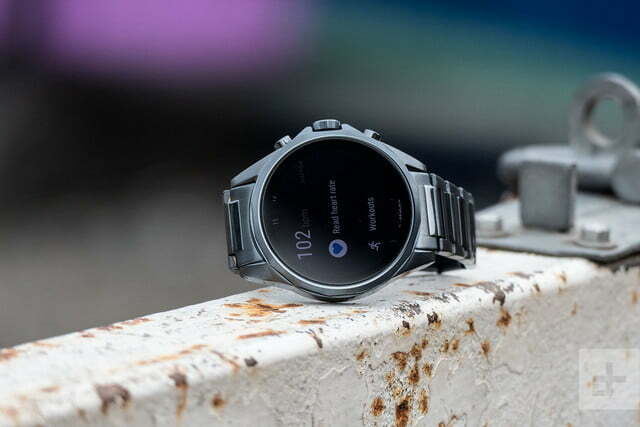 It operates as expected, and looks great, but Wear OS is still frustrating, the battery life is short, and there is nothing giving it any personality or Armani-related appeal. Because the AX Connected doesn’t do anything specific, and doesn’t manage to effectively separate itself from the competition, there isn’t a compelling reason to splash out on one.